The Peterborough Lions big wigs believe there’s light at the end of the tunnel . . . trouble is that tunnel is getting longer by the minute. Saturday’s home loss to Otley was the Lions ninth defeat in 10 games and leaves them rooted to the foot of the National League Two North table. And, worryingly, they are 12 points from safety with a third of their games now gone. He did have a point. 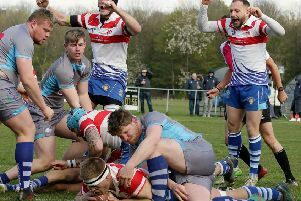 The Lions’ performance was a massive improvement on their last showing at Solstice Park when they got stuffed 43-14 by Huddersfield and they were more than a match for their visitors from West Yorkshire. In fact for long spells they not only matched Otley, they dominated them. The difference was in the finishing department. Otley’s nippy backs scooted in for four tries on the counter-attack whereas the Lions managed just two touchdowns despite battering away at the try-line for sustained patches of pressure in both halves. The entire Lions pack all had drives for the line halted, Aki Lea actually had a try disallowed for a toe in touch and new full-back German Herrara Luhrs, an exciting Chilean international, was felled just a foot short. There is no game this weekend, giving the wounded Lions more time to recover in time for a trip to Preston Grasshoppers on November 17. Then games follow against four more teams in the bottom half of the table - Macclesfield, Leicester Lions, Sheffield Tigers and Tynedale. “It’s a massive run up to Christmas for us,” said Moore. “We’ve got to get something out of those games and if we play like we did against Otley and up at Sedgley Park the week before that then I’m confident we will do so. There were good wins for Borough and Oundle in Midlands Division One on Saturday. Third-placed Oundle smashed lowly Leighton Buzzard 53-8 with Robb Shingles, Joe Roberts and Grant Snelling all crossing twice while Borough won 27-8 away at Wellingborough with tries by Ross Chamberlain, Ryan Morris, Matt Newman, Tom Stuffins and Mooki Tshepo-Olebile to move up to sixth in the table. Morris, Michael Bean, Zac McClure and Jamie Dingle all had fine games. Borough Ladies’ brilliant start to life at National Women’s Conference Midlands Division One level after winning promotion last season continued on Sunday. They won 19-12 at Olney thanks to tries by Sarah Winder (2) and Kaleigh Wheeler to continue their unbeaten start. Wheeler and Winder were named forward and back of the match respectively. Borough are second in the table, a point behind Sutton Coldfield, and their next game is away to Sutton Coldfield on Sunday November 18. Borough Juggers take on Old Deaconians at Fengate on Saturday in the annual Anthony Egglestone Memorial Match (1.30pm kick-off). Old Deaconians team: Paul Stimpson, Steve Hoffmann, Howard Tilney, Dave Hagerty, Dave Musson, Darren Theakston, Lakhbir Bondhi, Paul Hoffmann, Roger Paton, Andy Lesiw, Tariq Iqbal, Pete Talbott, Pete Brudnell, Dave Brudnell, Matt Stuffins, Dan Stuffins, Dave Lutton, Ajaz Akhtar, Andy White, Jack Drewery, Clint Bell, Andy Meikle. Six Peterborough players have been selected for the England Touch Rugby junior training squads. Included among the 45 girls and 59 boys who will attend training days in January and February are Borough brothers Sam and Harry Missin, Leah Lilley, Liberty Ashdown (both Borough), Amelia Grota (Peterborough Touch) and Logan Noble (Arthur Mellows Village College).